!! THE RACE FOR JUNE TOMATOES IS ON !! Great idea RBG, kinda funny I was eyeing the metal racks at Lowe's the other day thinking the same thing you are doing. My problem is I don't have a great place to put anything like that without lights. I guess I could kick one of the kids out of there rooms and throw them in the cold basement and turn there room into a grow room, nah I couldn't do that to my little angels. 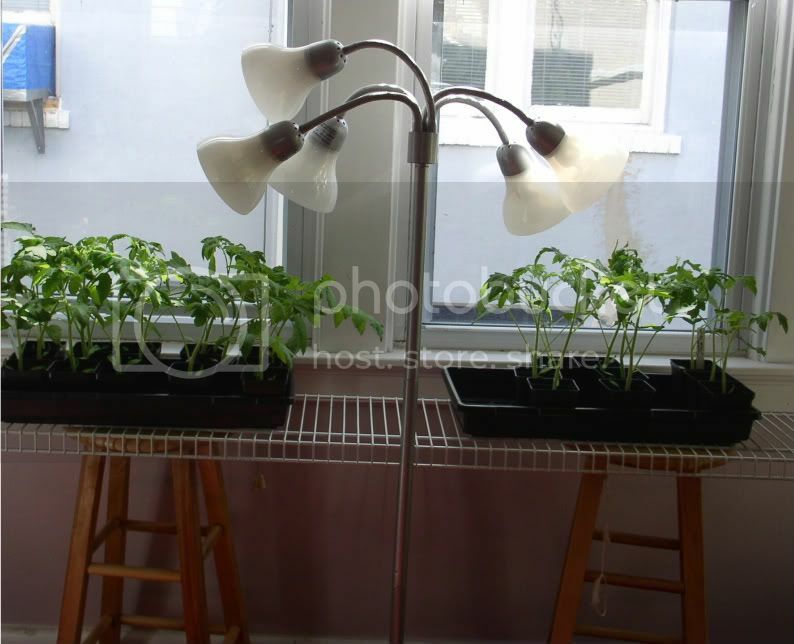 I have thought about everything, my house just isn't set up for indoor growing without lights very well. But that's okay because my outdoor garden couldn't be situated any better. Vermontkingdom I know how you feel, I have been off wrok a LOT lately and went totally nuts one weekend just planting everything. Now I'm overrun if it doesn't warm up enough to get some of this outside soon I might have problems but hey, what are you gonna do. Small set back, in the assembly of my portable greenhouse I broke a connector, HF support said it would take 10-12 weeks for a replacment! I continue to love the homemade newspaper pots! gixxerific wrote: Great idea RBG, kinda funny I was eyeing the metal racks at Lowe's the other day thinking the same thing you are doing. My problem is I don't have a great place to put anything like that without lights. In case you missed it, the mini-greenhouse/ wrapped shelving is OUTDOORS. It is for transitioning things out, hardening off, getting things outdoors a little sooner with some protection. It gives me a place to put things that need to get moved out from under the lights, to make room for other stuff. It sits on my deck, tied to the deck railings. That's why it doesn't need to have any lights. RBG I see, that could work but I would have to put it in the front of my house where all the neighbors can look at it and think bad things but......... I don't have a deck but I guess I could set it up in the actual garden, now there's an idea. Oh well too late for this year maybe next. Seagullplayer do you have any "vice grips" or any other kind of clamp that would be a good temporary fix for your stand? :EDIT: Sitting here thinking that you had a great idea RBG and the fact I didn't want to spend any money this late in the game, I'm looking around the house like I do to see what I can McGyver into something. Low and behold I have a small floor table that is basically a one level shelve like you are using. I already have plastic, heck I even have Velcro I could use. So maybe I can get some of my cool weather stuff out there after all. Problem is I have started working again and I leave very early, but if the temps stay above freezing in the morning I can put stuff out. I leave to early to be shuffling this and that in the dark coldness. But it looks like the weather is finally giving us a break, good ol' St Lou we have winter than a week or two of spring than full on Summer. gixxerific wrote: RBG I see, that could work but I would have to put it in the front of my house where all the neighbors can look at it and think bad things but......... I don't have a deck but I guess I could set it up in the actual garden, now there's an idea. Oh well too late for this year maybe next. I'm picking up some super glue and a bolt on the way home, I'm using a drill bit from work, wish me luck. If this "fix" won't work, I am taking it down tonight and returning it Friday to the other store, I just hate to take it all back down. The plants yesterday, I still have much work to do. I will post a seperate thread about the greenhouse later. This is a cool picture if you click on it to enlarge... all the little carnivorous hairs we learned about awhile back! They are 5-6" tall and sturdy. Doing well considering they have a month to go yet before going out.... I don't know where I'm going to put everything! See also the my seed starting operation thread for pics of other stuff. Wow, an ant's eye view of your tomato forest! Lookin' GREAT! Definitely 2 weeks or more ahead of mine by my reckoning. Will you uppot again? They're in 3" or 3.5" pots right? It's such a dilemma -- uppot and you need more space, but if you don't, the foliage crowd/shade each other and who knows what's happening to the roots! I'm having the exact same issues. You nailed it exactly. AS.... They are in 3" pots and with a month to go they would definitely do better if up-potted. But I'm about out of room already! I am starting to eyeball the bathtub, maybe for trays not so hard to move? Tee hee. Really, it is almost that or give them my bed! I have simply got to get plants uppotted and out of here. Good news, the plants in the unheated mobile are doing fine, just in front of the sliding glass doors. No lights, no heat. But, the next tray over there, will have to go on the table with lights, fan and all. I am noticing the plants still in here in the warmth are growing faster. The cool there seems to be slowing them down. 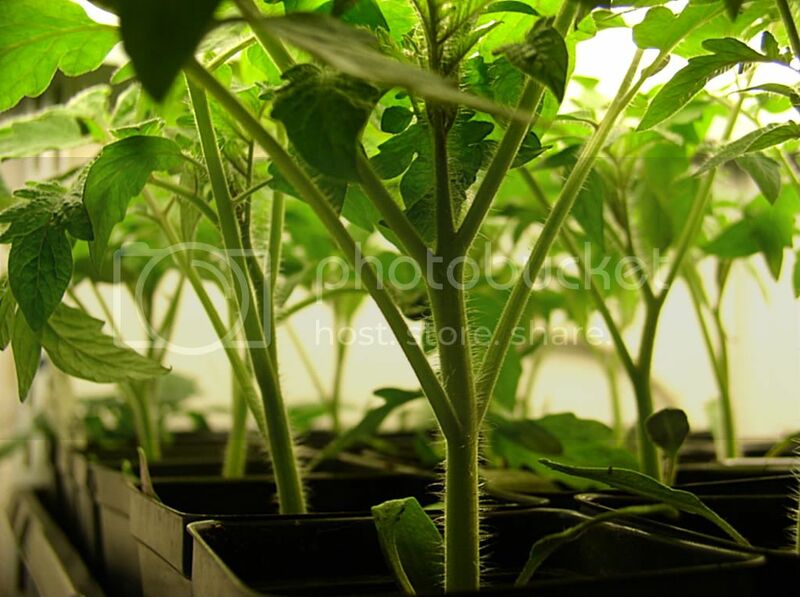 We put lights on shelves, just last weekend, you can watch the plants grow now... they are growing that fast! Uh oh! I have a small bud set growing on one of my June race maters! My seed starting area is rapidly getting too full, the tomatoes are already getting too big and clearly aren't going to make it another month in the 3" pots ... what to do, what to do? MH came home from work and didn't even blink to discover more square footage of the living room given over to my plants! The wire shelf is the one I just took down when I finished converting the second shelf in the basement from 6 to 8'. It's just sitting on top of a couple stools. We don't have great plant windows. That would be a good west of south window, but as you can see it looks out at the neighbors house just across the driveway. So the lamps should hopefully give enough supplemental light to get them through. Now I just need to somehow acquire some 6" pots-- I've never collected those. There's one more tray of tomatoes to come up and they will get up-potted once I have the pots. Makes more room for the other stuff in the basement too. I think my hubby is beginning to have nightmares of plants chasing him! I just came inside from building a raised sunflower house bed (with cardboard and straw) and extending the rice paddy and building a new raised tomato bed... just as the last of the evening light faded. Mine was laying out the take out seafood in the kitchen, looked over and simply said, "Done?" Do you ever work so hard that you have to tell yourself to save a reserve for putting away the tools, then get up after a few minutes of rest to tweak the garden some more... and end up hauling wheelbarrows of mulch and dragging the hose around to water? That was me. I'm hurtin' already! I'm in the same boat RBG my tom's are getting BIG. Though I have some bigger pots. I'm just worried that they won't be any good come planting time. June: Too late to start growing tomatoes? 3 - 2- 1 GO!!! The race is on! Too Much rain in June!! !